A young Weipa woman has graduated from JCU with a teaching degree she was able to complete in her community through an award-winning remote area education program. A young Weipa woman has graduated from James Cook University with a teaching degree she was able to complete in her community through an award-winning remote area education program. 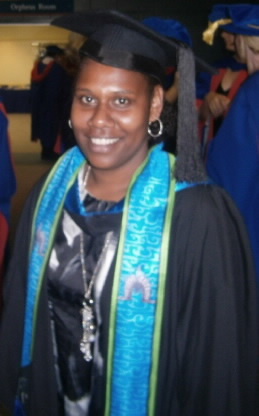 Rebecca Namok, a Torres Strait Islander, graduated with a Bachelor of Education from JCU last week but she began her studies for the degree while still at high school. Ms Namok completed a Certificate III and a Certificate IV in Education (Aboriginal and Torres Strait Islander) while in her senior years at Western Cape College at Weipa through the Remote Area Teacher Education Program (RATEP). RATEP is a community-based teacher education pathway for Aboriginal and Torres Strait Islander people. The award-winning program is offered as a partnership between JCU, the Queensland Department of Education and Training and Tropical North Queensland TAFE. It enables Aboriginal and Torres Strait Islander people to remain within their local community while completing the requirements of the Bachelor of Education at a RATEP site or Thursday Island campus. Rebecca said that at first she was not sure what she wanted to do but the Cert III “was an opportunity and when I began my passion for teaching began to grow even stronger”. Ms Namok said she liked teaching because it was helping shape the future. “What I like about teaching is the positive feeling that as an educator, you play a major role in educating students who are citizens of the future,” she said. Since graduating from high school, Rebecca has completed a Diploma of Education (Aboriginal and Torres Strait Islander) through Tropical North Queensland TAFE then continued on to the Bachelor of Education at JCU while living in her home community of Napranum. RATEP, which has a study centre at Weipa and 16 other locations across Queensland, provided Rebecca with academic support and access to the information technologies needed to complete her studies successfully. Helen McDonald, Director of RATEP at JCU, said Rebecca was the first in her family to gain a university degree and her achievement would ensure she is a role model to her family and her community. Ms Namok hopes to teach years One to Three at Western Cape College in the future. “That is one of the main reasons for the RATEP program - to give Aboriginal and Torres Strait Islander people the opportunity to study in their home communities,” Ms McDonald said. For more information, contact Rebecca on email: rebecca.namok@my.jcu.edu.au Phone number available on request.